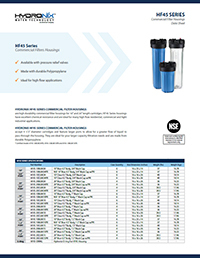 are high durability commercial filter housings for 10” and 20” length cartridges. 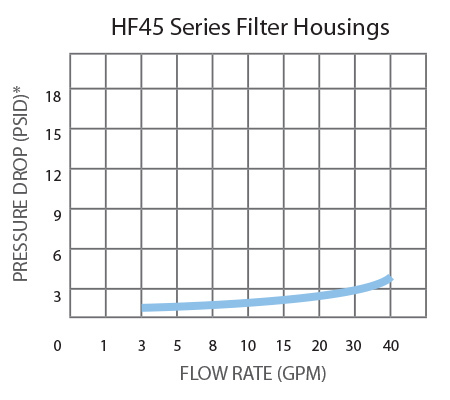 HF45 Series housings have excellent chemical resistance and are ideal for many high flow residential, commercial and light industrial applications. 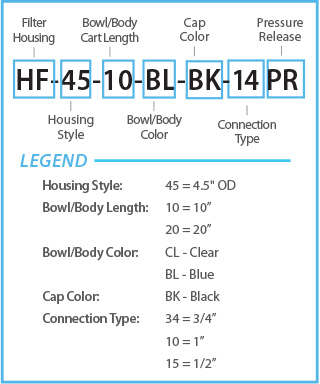 *Certified model: HF45-10BLBK34PR, HF45-10BLBK10PR and HF45-10BLBK15PR. WARNING: READ THESE INSTRUCTIONS BEFORE CHANGING OR INSTALLING. FOLLOW THESE INSTRUCTIONS TO REDUCE RISK OF DANGER.CAUTION: Filter housing must be protected against freezing and extreme temperatures. Filter housings should not be in direct contact with sunlight for a prolonged period of time since uv rays can make housings brittle. Pressure should always be measured before installation and water pressure regulators should be installed in the main line or in front of the housing if water pressure exceeds manufacturers’ maximum water pressure: 75 psi. Installers should make sure filters and replacement filters are the correct length and are not too long so as to not cause undo strain and stress on the housing. A leak detector must be installed on all installations where high pressure, water hammer and pressure spikes are known or suspected to be present and on all installations where pressure is over 60 psi. Failure to the above may result in cracking of the filter housing, water leakage and water damage. 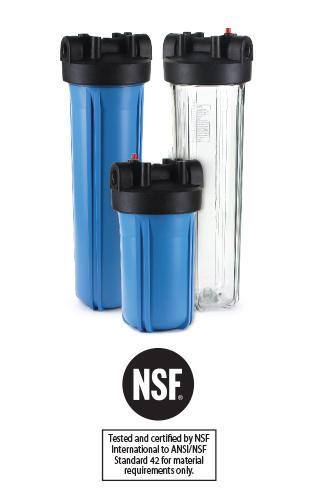 Caution: All filtration systems contain other parts that have a limited service life. Exhaustion of the service life of those parts often cannot be easily detected. Commonly, it is only after leakage has been observed or water damage has occurred that one is made aware that the service life has been exhausted. Important notice: To prevent costly repairs or possible water damage we strongly recommend that the bowl or sump of all plastic housings be replaced periodically: every 5 years for clear sumps, and every 4 years for opaque sumps. If your sump has been in use for more than the recommended period, it should be replaced immediately. Be sure to date any new or replacement sump for future reference and indicate the next recommended replacement date. exceeding maximum pressure or failure to follow these instructions will void limited warranty. DISCLAIMER OF WARRANTIES: Except as expressly warranted in writing by Hydronix water technology, the goods sold by Hydronix water technology are purchased by the buyer ”as is.” Hydronix water technology does not warrant that the goods are of merchantable quality or that they can be used for any particular purpose. Except as expressly warranted in writing by Hydronix water technology, Hydronix water technology makes no representation or warranty of any kind with respect to the products. LIMITATION OF LIABILITY: In no event shall Hydronix water technology be liable to the purchaser or any other entity for more than the invoice price received by Hydronix water technology for any non-conforming products. Hydronix water technology shall not be liable to the purchaser or any other entity for personal injury, property damage, or any direct, indirect, special, incidental, consequential, punitive, exemplary, or other damages of any kind, including without limitation the cost of procurement of substitute goods, the loss of profits, products, or production, or the interruption of business, however caused and on any theory of liability, and whether or not Hydronix water technology has been advised of the possibility of such damages. The essential purpose of this provision is to limit the liability of Hydronix water technology arising out of the sale of products to the purchaser whether for breach of contract, negligence, or otherwise. These limitations shall apply notwithstanding any failure of essential purpose of any limited remedy and notwithstanding the provisions of any other agreement between Hydronix water technology and the purchaser.